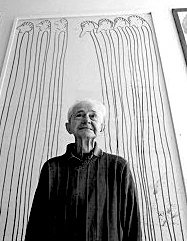 Oswald Tschirtner started drawing in the Haus der Künstler, Gugging. Outsider Art Source Book, (Raw Vision) 2016, p. 209. At the end of the fifties the patient ‘O.T.’ had been released from captivity as a prisoner of war (POW). In the Haus der Künstler of the institute Maria Gugging, Dr. Leo Navratil began to let him draw for purely diagnostic interest. Up to his death he only worked in the presence of an assistant. However, Navratils psychiatric conclusions were less enduring than the amazing style, which Tschirtner developed over the following ten years.